30-second trades are the newest type of binary options online trade that we are starting to see brokers add to their lineups. GOptions is going to start offering this type of trade now, and you can expect that other brokers will also want to get in on the new trend. 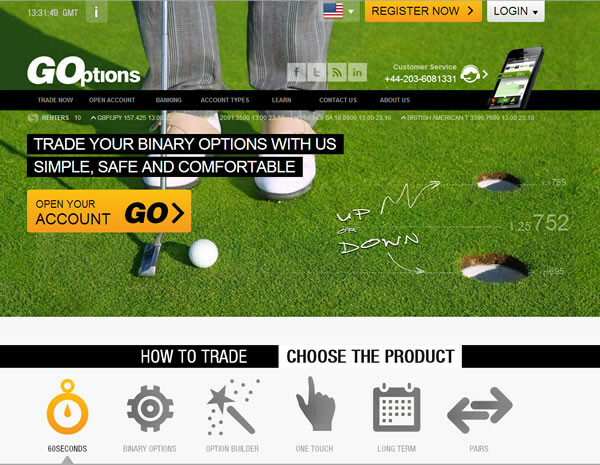 Fast binary options online have been popular for a long time. If you have already traded 60-second options, then you know more or less what you can expect. 30-second trades are built on the same principles, but they go twice as fast. If not, or if you are brand new to binary options online trading, read on to learn more about it. Reputable broker with 30 second binary options online. 30-second binary options online trades, like 60-second binary options online trades, are based in High/Low trades, which are the most basic form of binary options online. With this type of trade, you look at an asset, and you answer a simple question about the price of that asset. Will it be trading above or below its current value by the time the clock runs out? Each trade has a given “expiry time,” which determines when the clock does run out and the trade is complete. If you correctly call “High” or “Low,” your trade expires “in the money,” and you get a payout. If you guess wrong, then your trade expires “out of the money,” and you get nothing. The have been the fastest trades available up until now. With the recent introduction of the turbo style binary options online from GOptions, traders and gamblers can get their fix in half the time. You can only trade the up/down trades. As you know, high/Low trades can have all different expiry times, but most close within the same day and last a couple of hours. But when the expiry time is 30 seconds, and the trade ends in just half a minute, you have a 30-second trade—and that is how it works! 60-second trades are just the same, only they have expiry times set at one minute, not half a minute. One nice thing about trading 30- or 60-second trades is that you always know exactly how long they are going to last, and you never have to double check the expiry time. These trades are listed in their own area, separate from the rest of the High/Low trades. Let’s look at an example of a 30-second trade so you can understand how it works in action. Dave is a scalper who has just discovered 30-second trades, the newest trade type offered by his broker. Dave likes to trade currencies, and pulls up a chart of the GBP/JPY to see if he can spot any opportunities. After skipping some imperfect setups, he spots an excellent one with a payout of 80%, and he immediately takes action. He is confident that within 30-seconds, the price of GBP/JPY will surge upward, and that the trade will close in the money. He has to act fast, because these opportunities fly by. He immediately invests 3% of his account in the trade, which for him is equal to $100. He chooses “High,” or “Up,” or “Call” (all of which mean the same thing; different brokers may use different terms), and waits half a minute. Sure enough, the GBP/JPY surges upwards, and after 30 tense seconds, Dave wins his trade, and finds himself $80 richer! Can you imagine making $80 in just half a minute? For most of us, that is a full day’s work! Now imagine being able to eventually quit your day job and trade binary options online full time. What an opportunity! While the example above makes binary options online trading sound really easy, you do need to remember that making money always requires effort, and there is a reason that Dave only invests 3% on each of his trades. He was also risking his entire investment, and could just have easily lost it all within the allotted time. If his broker provided him with an out of money reward of 10%, that means he could have lost $90 in just 30 seconds. And yes—if or when something like that happens to you, it will be devastating. And you will lose trades. That is why you want to do everything you can to minimize your losses and maximize your gains. Practicing is what allows you to do just that. Start out by doing some backtesting using historical data (you can load that into your charting platform if you are using MetaTrader 4 or a similar program). Step your charts forward one candle at a time, and follow along, “entering” trades as they appear. See how many 30-second trades you would have won or lost using your strategy. Only once you get a high win percentage which would cause you to be profitable (don’t forget to compensate for low payouts in your calculations—if your average win is smaller than your average loss, you need to account for that) should you start demo testing. Demo testing allows you to try out your techniques on live data without investing real money. Read more about how to demo test binary options online. You may be able to place a trade in 30 seconds, but you will only consistently place winning trades after you put in the time you need to really learn how to trade. That entails a lot more than 30 seconds of effort. The extra time and effort will pay off hugely though when you start seeing those winnings rolling in, and when you can stay in the game long enough to really make it.